Comics are at their best when a story evolves naturally from the artistic endeavors of the creators, when the story’s tension builds through character actions, when the climax throws the hero’s life into shambles. The best stories are spread through many issues of a single series—not planned in a boardroom with profits in mind. They are tales like The Dark Phoenix Saga or Ed Brubaker’s Captain America run. 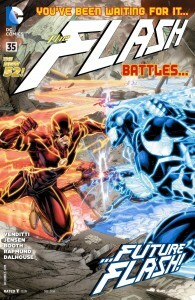 And, as each month passes, Van Jensen and Robert Venditti are positioning The Flash to join the ranks of great stories. Barry Allen has faced plenty of problems since the events of Forever Evil. He’s been helping rebuild Central City, hunting for super villain weapons liberated from police headquarters, and experiencing the loss of time. Also, there’s a future Barry Allen who has been traveling through the past correcting all the mistakes he made. The final step in his backwards journey is to kill present Barry Allen, the result of which will repair the damaged speed force. After months of buildup The Flash #35 showcases the fateful battle, the results which further spin Flash’s world out of control. Jensen and Venditti have written an epic storyline we don’t often see in modern comics. Most times a plot will wrap up within six issues, just in time to fit into a graphic novel. But when a story is allowed to breathe, to develop on its own, that’s when comic legends are developed. It’s still early to call the current Flash storyline the stuff of legend. The fallout from the current issue’s big showdown twists the narrative not into an epilogue but act two. There’s plenty of time to falter, but Jensen and Venditti have delivered every step of the way. They’ve continued to propel The Flash and Green Lantern books after dynamic runs from previous writers such as Francis Manapul and Brian Buccellato and Geoff Johns. With their early track record, there’s no reason to not expect greatness as The Flash continues to face the challenge of future Flash. Add the beautiful artwork from Norm Rapmund, Brett Booth, and Andrew Dalhouse into the mix and the visuals add storytelling tension with gritty and kinetic energy. Most important of all, the creators are delivering fun. There are a lot of dire situations in the world of comics right now from giant events such as Original Sin and Axis to the Green Lantern Corps battle with the New Gods. The Flash certainly has his own problems, and at the end of issue 35 they take a turn for the worse, but no matter the situation The Flash has never lost the fun. It’s old school comic storytelling—a likable hero who does things by the book, dangerous situations, and a light-hearted feel to all of it. Who knows if a decade from now readers will be waxing poetic about this Flash storyline the way they do about great comic tales. But that’s something to worry about later. Right now it’s nice to just enjoy the ride.